old journals. – static confusion. fearless: don't ever hesitate to write your thoughts down. we should all learn from ourselves one day. i read today. the author who intrigued me was myself. and it was an overwhelming experience to say the least. 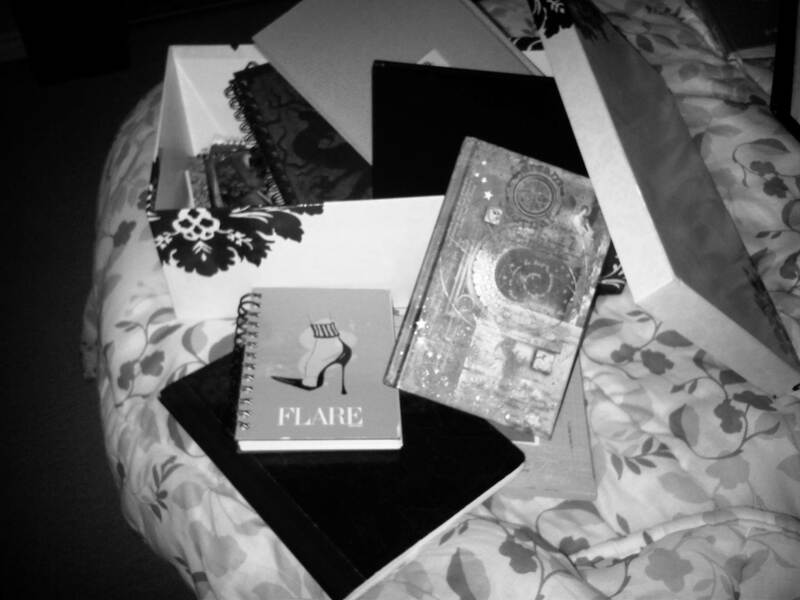 perched on my bed in my parents’ house where most of the words were written i took the lid off of an oversized shoe box and sifted through more than a dozen notebooks and diaries. from 1997 to 2009, pages filled with poems, self-professed quotes, attempted insight, quasi short stories, long-winded rants, sad thoughts and happy memories. the penmanship ever evolving (at times sounding lost other times quite profound) and the characters vivid reflections of those that intertwined themselves in my world over the years: the first love, the young love, the confused love, the stupid love, the silly love, the yearning love, the pity love, the broken love, the sisterly love, the friend love … all types of mad-crazy, beautiful love. journal writing can be quite confronting literature–especially when you keep them and reread them. in essence, these words are the archival blueprint of my life. once confided on paper open for anyone to read. some of the sentiment i remember feeling other chapters i can’t even recall living but i did apparently according to the scrawled handwriting on the thousands of bounded-lined sheets–from my first day of high school to the day i decided to vacate canada it is all there. most of it raw and easy to embrace and some of it i wish had been written in pencil as to make it easy to erase. but at some point in time the past was the truth and the present nonexistent; the future was dreamed about with apparent determination to sacrifice my own desires in order to save someone else. everlasting growth really. the journals are dated and with some structure it appears that i dedicated one year to one book so as to read them now, in sequence, it is like scrolling through my life plot, curiosity the endless theme and my heart providing an intimate narrative. it also appears as though the ages between 22 and 25 is where my story climaxes but every chapter (year) enduring and drama-filled as the next. a young passionate girl, what else was i to expect. perhaps the most surprising thing that surfaced from the pages were three recurring connections: emotional references to music, a fascination inkling of life as a bird and my endless search for fulfilment. maybe it is because these days i’m wiser or my pursuit for inner peace has opened my eyes but i never realised that throughout my teenage years and into lady adolescence I had been evolving somewhat subconsciously through an organic path of sorts only this time i see it–i actually get it. and i suppose as in recent writing i’ve been linking all of my faded thoughts, nostalgic memories and emotional footprints together: from static confusion in 2010 to conflict and contradictions in 2011.
and as i’m drafting the text for my next chapter in life (2012: nesting) my heart, it is lifted; my mind it is clear. my laughter is continuous and my spirit is healthy. it is a good place to be, however, if today’s readings have taught me anything it is that even when things were loopy (myself included) i lived that phase of my life fully and loved the people in it entirely. and even as that part of the story was ending a new plot was beginning amid intense curiosity and chaotic adrenaline. so, my epilogical conclusion: just keep turning the page … life is a never ending story. literally. Loved this reflection! Makes me wish I had been recording my own life more consistently. I have a couple of diaries from my school years which I read while I packed up my life to move to Melbourne and I found it at times excrutiating to read them! But also enjoyed that glimpse into another world that seems so far away now. Like you, there were events and emotions that I didn’t even recognize but I’m sure they exist in me still at some cellular level, like I believe every memory does.